FLORÉAL, Mauritius, April 5, 2019 /PRNewswire/ -- LUX Hospitality announces the official opening of its latest resort in the Maldives, LUX* North Male Atoll. The resort offers travellers an intimate all-new interpretation of the ultimate Maldivian experience. LUX* North Male Atoll: Opening in February 2019, we will unveil LUX* North Male Atoll where the ubiquitous thatched-roof water villas have been replaced by contemporary white-washed penthouses tinged with bright pink and set with swimming pools, with twilight views, and immense rooftop-decks that look across the expanse of iridescent turquoise sea. Whether your villa is on stilts over water or tucked away between palms on the beach, you’ll have your own plunge pool and sundeck. In true LUX* style, the warmest of welcomes greets guests, along with Maldivian dazzling dancers in colourful sarongs. LUX* North Malé is designed in a way that guests are given an incredible amount of space, with sleek pared-back decors in soothing whites, with tasteful touches. Each villa is outrageously spacious, with bathrooms as big as the bedrooms and outdoor showers. Guests can host their own exclusive barbecues or a special-occasion party on their own penthouse rooftop. Guests can walk the outer loop in less than half an hour. Here on this idyllic isle, villas feel like private worlds within this soul-stirring tropical setting. Forward-thinking architecture sees windows flung open, tempting to live life in the greatest outdoors. Every rooftop promises a different perspective on Maldivian panoramas. Guests can step out from any edge and go snorkelling and tick off tropical fish from a lengthy checklist. Dolphins, stingrays and turtles are among the characters in this thriving reef, brought to life by the on-site marine biologist. Travelers are invited to float through a resort which celebrates nature at its purest. Never formal or fussy, the team at LUX* presents a unique style of service, which demonstrates unwavering attention to detail and a commitment to anticipating every need. Breakfast is a tempting spread of flavours and cuisines; lunch and dinner and everything in between, is à la carte. In the restaurant, culinary experts host masterclasses, sharing skills and secrets about the most special ingredients. Serving plates large and small of Peruvian-Argentinian-Japanese delights, blend Latin American flavourings with Asian seasonings. At Beach Rouge, splashes of red accentuate the vibrant blue. Here one can find the more sociable of our islanders, eating, drinking and soaking up that vitamin D from a sun lounger… It's a dream scene for long lazy lunches and suppers under the stars. Floor-to-ceiling windows and first-class therapists are features of the LUX* ME spa set along its own jetty. It's a corner of complete calm where views are only interrupted by elegant long-winged birds gliding across the horizon. Flower-filled gardens are framed by trees stretching over as though in graceful yoga moves. Those who like their luxury served with kindness and care, be assured this resort is sensitive to the environment, conveying where it can that life is best lived with a conscience. There are no single-use-plastic shockers or disposable containers — we pride ourselves on refillable glass water bottles and ceramics for the highest-quality amenities. Check out the boutique for sustainable fashion brands. Playful but sophisticated, fun but poised. Stand-up paddleboard when the mood is on, or be whisked away to a secret sandbank for sunset cocktails. Pad around the island to find ICI for an exotic house-made ice-cream. 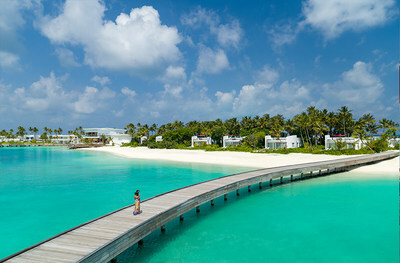 Or charter a superyacht and let the captain chaperone to Turtle Point, a sanctuary for marine life. Every moment here matters.